Fasano led the Senate Republican caucus in crafting a detailed budget solution which protects state services for at-risk individuals and is urging state lawmakers to allow a debate on the Senate Republican budget. Sen. Fasano speaks to a group of individuals with disabilities, their families and advocates about the importance of supporting a budget that protects core services at the state Capitol on July 18. 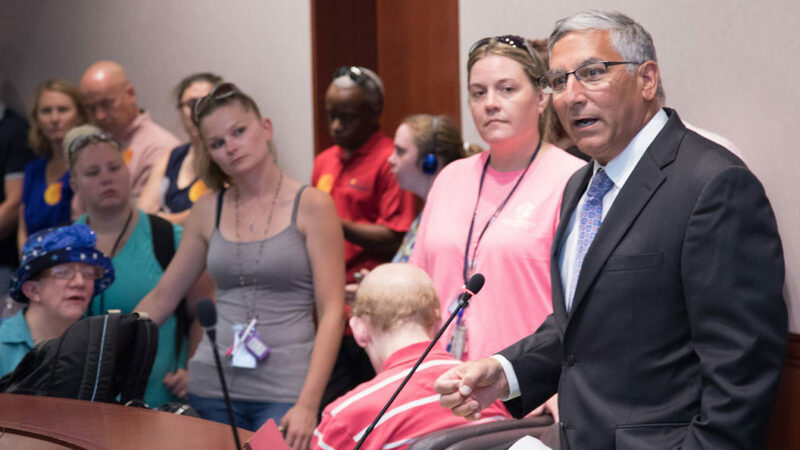 Senate Republican President Pro Tempore Len Fasano (R-North Haven) on July 18 welcomed advocates for the disabled to the state Capitol and spoke at a rally to urge passage of a budget which preserves vital services for vulnerable state residents. Fasano led the Senate Republican caucus in crafting a detailed budget solution which protects state services for at-risk individuals and is urging state lawmakers to allow a debate on the Senate Republican budget. It can be viewed at www.NewDirectionCT.com. “My colleagues and I are committed to getting Connecticut’s fiscal house in order so that we can once again be a state that attracts and grows jobs and people. This means cutting spending and reducing financial burdens, but not by taking services away from the state’s most vulnerable people,” said Fasano.